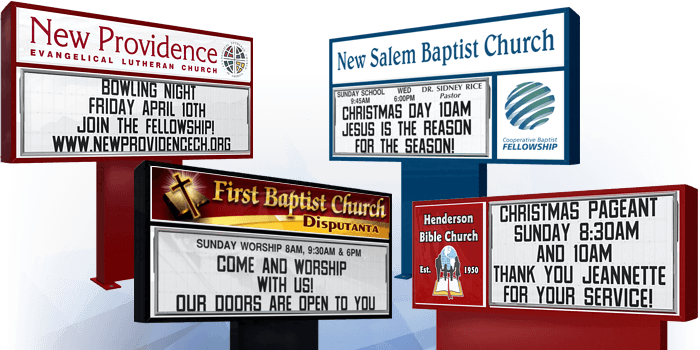 Changeable letter church signs that will communicate your message. Reach your target audience and update your message with ease! Our changeable letter signs offer high quality, affordable communication with everyone that passes by. A full set of premium letters are included. Our extended message area signs have letter tracking that reaches from one end of the sign cabinet to the other, creating the maximum amount of space for your message. These sign faces incorporate additional space for your organization's symbol or logo. Communicate instantly and powerfully using your changeable letter sign graphics! Turn your changeable letter sign into a community landmark! These signs offer dual cabinets or other special design elements to increase visibility and draw attention. These signs provide the flexibility of a changeable letter area at a lower overall height. Select these signs if there are zoning, traffic or line-of-sight considerations. Share your message with a changeable letter sign!